The Titanium Dermaroller is a convenient multipurpose device used for the treatment of various skin conditions such as wrinkles, scars, acne scars, hyperpigmentation, cellulite and stretch marks. It comprises of a cylindrical barrel with precision engineered titanium microneedles which penetrate the top layers of skin without causing damage or bleeding. This accurate and minimally intrusive penetration allows much higher absorption of topical formulations, such as various serums and creams. 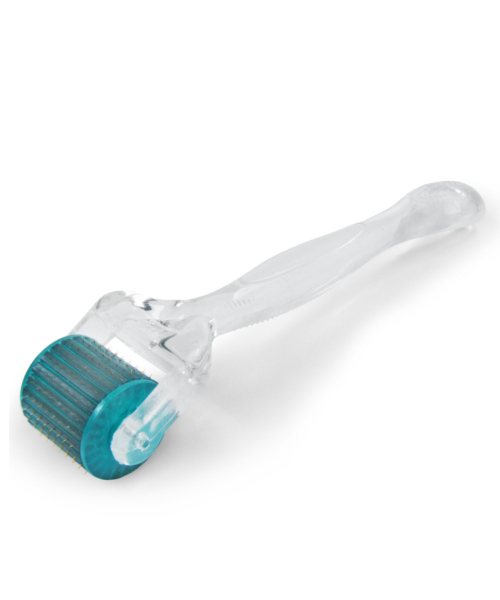 This Titanium Dermaroller can be used in conjunction with the majority of skin care out there. 1. STERILIZE: Sterilise the Titanium Dermaroller with a sterilising solution and allow to dry before every use. 2. CLEANSE: Cleanse face, neck and décolleté using your preferred cleanser suitable for your skin type and pat skin dry. 3. ROLL: Visually divide the skin into sections (forehead, left cheek, right cheek, nose, chin, left side of the neck etc.). Using a constant, gentle rolling motion roll 10 times back and forth over each skin section. 4. CORRECT: Apply Serums in the usual order and allow to absorb. 5. MOISTURISE: Finish with your preferred moisturiser. 6. FINISH: Clean roller with hot water and return to case, leave to dry. Frequency of use (for 0.3mm) : 2 – 7 times per week, depending on skin tolerance. To build up skin tolerance to Skin Needling, allow 3 day intervals between treatments for a minimum of 2 weeks. Gradually increase frequency of use, as your skin becomes adjusted to needling. Do not use more than once a day. Numbing cream needed: Apply a topical local anaesthetic cream on the entire treatment area 45 minutes prior to treatment. Remove the anaesthetic cream and wipe the skin with an antiseptic solution to disinfect the treatment area. These needles are engineered from high quality titanium giving a finer and much more durable edge, eliminating excess irritation caused by ordinary steel needles. Constructed from titanium, each precision engineered needle is super sharp to deliver the most pain-free treatment experience and to promote fast healing.